Donetsk, Ukraine – The Sergei Prokofiev International Airport at Donetsk is still one of the most hotly-contested sites in the Donbas region. It has been fought over for months. It used to be one of the most modern airports in Europe. The new terminal was completed only in 2012. Below are video images of what’s left. And go to the weblink above to see a photo gallery. Shocking. The site looks like a moonscape and would be the perfect setting for a doomsday movie in 2014. Beginning in the spring of this year, there was a serious attack by Ukriane armed forces to seize the airport grounds. Countless people became victims, including many civilians. The access road to the airport was called the ‘Road of death’ because it was covered with the bodies of the victims. It took days to recover bodies because Ukrainian snipers prevented their retrieval. 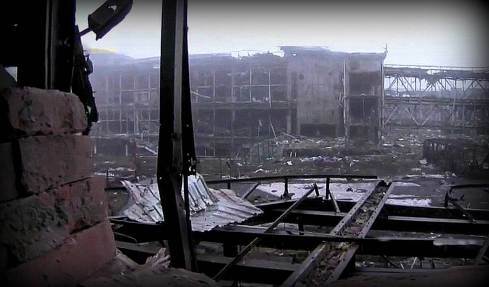 Today, the airport is in the hands of the militia of the Donetsk Peoples Republic. The residential areas around the airport are destroyed; the airport itself is the largest junkyard in the world. Soldiers of the militia who fought in the old terminal told UK video journalist Graham Phillips how they obtained the weapons they needed in the fight over control of the airport. No, the weapons didn’t come from Russians. You could buy them from the troops of the Ukrainian army.